Cross device tracking allows marketers to identify and follow internet users across smartphones, tablets and desktop computers. The goal of cross device tracking is to be able to identify a person across platforms and therefore deliver smarter ads. Tracking consumers on desktop is easy because of “cookies” – small text files that log when a user visits a site. On the other hand cookies don’t work on the majority of the mobile apps. 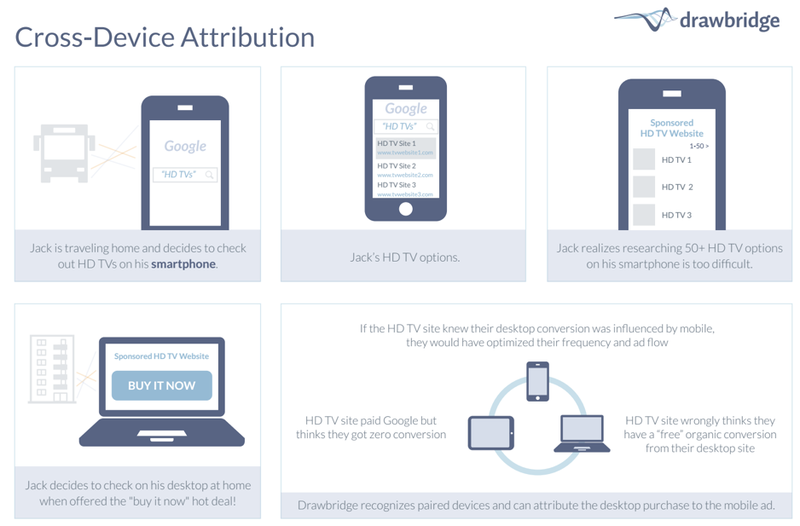 This makes it difficult to track consumers’ activity both within and across devices. There have been many technical developments on the field, the two main ways cross device tracking could be achieved are: deterministic and probabilistic technologies. Deterministic tracking is achieved when sites ask their users to sign in with their logins on every device they use. Examples are Facebook and Twitter. Probabilistic tracking is much more complicated as it is much harder to identify customers without these sign in details. For example the algorithm that Drawbridge uses enables us to attribute mobile impressions to desktop conversions.